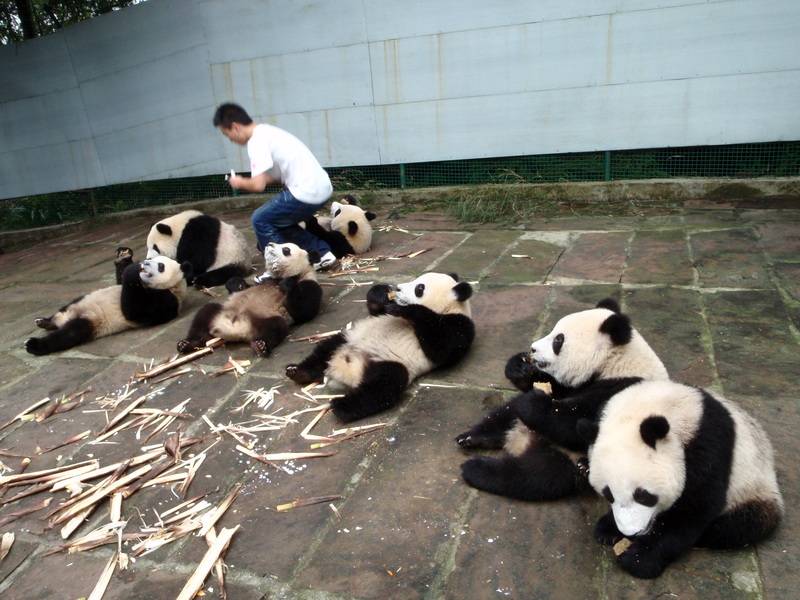 The Bifengxia Panda Breeding centre – where the Wolong panda’s are post earthquake. I enthusiastically swept up large panda droppings, cleared out old bamboo from my assigned enclosures, mopped floors and fed the panda’s 4 times a day.. which took a total of 2 hours actual volunteering time at the Bifengxia Panda Breeding Centre. 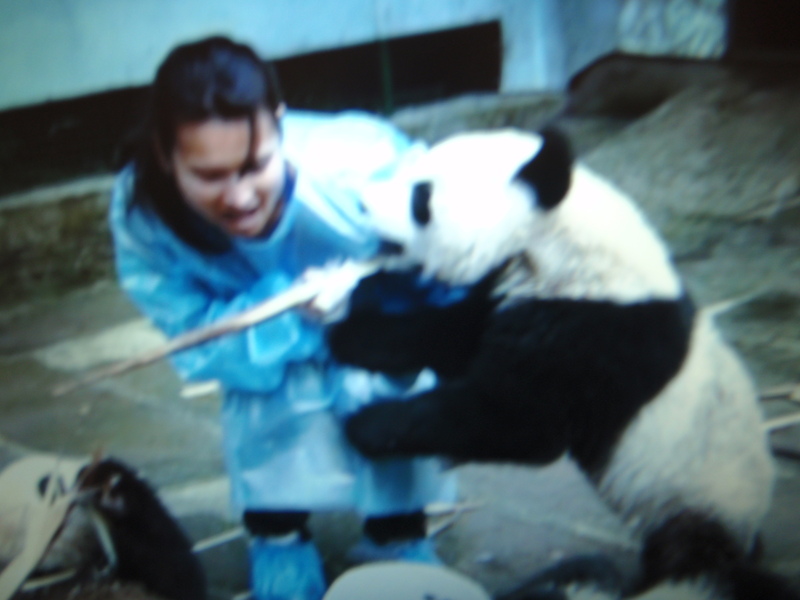 There were no other educational sessions and some of the volunteers were assigned to panda keepers who did not speak english so were unable to have any answers to their questions. As this was a paid volunteering program, (and it aint cheap to sweep panda poo!) I was pretty disappointed on my first day. In the in-between time, volunteers were just hanging around the base waiting for another 60 minutes to pass so they could spend 10-20 minutes, depending on how many volunteers were assigned to your enclosure, preparing panda cake, carrots and apples to feed the pandas, which happened 4 times a day. Amy seemed to disagree with most things about China, the cuisine, the language, the weather and (dare I say) the culture. 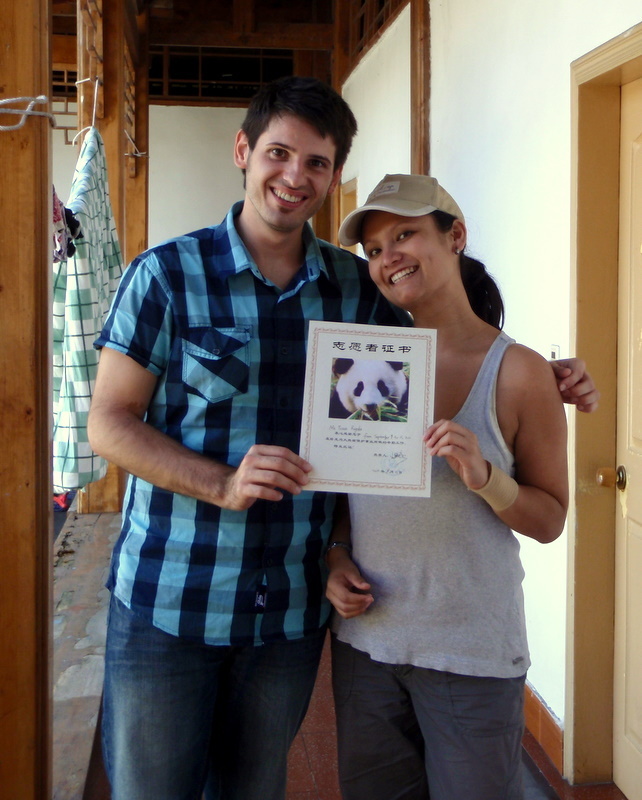 T – ‘… but you love animals?’ Thinking we had to have something in common having both volunteered at the Panda base. It was by great fortune that I met Anton, a biologist and researcher from the Vienna Zoo, who had been working at the Bifengxia panda base for the last 2 weeks researching the different types of vocals of the panda babies. Anton had access to areas of the base that only staff could enter, like the actual breeding centre which accommodated panda mothers caring for pink newborns, newly fluffy panda babies, and expecting panda mothers. He encouraged me to be his ‘associate’ and accompany him into this exclusive area where I was able to observe Anton running back and forth between maternal enclosures with all his sound gear trying to catch every baby panda’s vocal, all the time keeping me involved and informed with the different types of calls, answering all my questions, and providing a brief history of mother and baby. From then on, I knew that every volunteer needed to have their own personal Anton to make their educational experience at the Bifengxia Panda Base well worth it. The time had finally come for me to be with my beloved panda’s. I moved into the Panda breeding centre in Bifiengxia and got ready for my first interaction with the 1-year-old panda’s. Walking into the enclosure, I was greeted by the eight of them lazing around, eating, making mewing noises, and slapping each other on the backs. It was amazing. I scratch a few on their heads and start giving them some bamboo to eat, lazy things were just lying there on their backs waiting for me to hand them their food. Making them even more gorgeous!! He then lifts himself up from my knee and wraps his decent size jaw around my left shoulder. The pressure on my shoulder was so painful that it caused me to jump up with it still attached. He let go just as I’m fully upright and casually waddles off while I’m left there furiously rubbing my shoulder and calling him names. The keepers were not impressed. But one of the helpers managed to snap a photo.